Gap states in amorphous hydrogenated silicon (a-Si:H) doped and microcrystalline silicon doped n and p were examined by analysis of subgap absorption spectra obtained by the Constant Photocurrent Method (CPM) and the Photothermal Deflection Spectroscopy (PDS). Assuming a Gaussian distribution of defect states in the gap, broad distribution of states was found in a-Si:H and doped a-Si:H. A dependence of the defect concentration on Fermi energy was detected and analysed by thermodynamic model of defect formation in a-Si:H.
Over the last decade, attention has been paid to study hydrogenated microcrystalline silicon because of its good optoelectronic properties, and stability against light-induced changes . But the nature of density of gap states (DOS) of is still not well understood, because of structural heterogeneity of this material. Recently, Sanjay Ram et al. [2,3] proposed numerical simulation modelling using Shockley-Read statistics in steady state conditions which describe the effective DOS picture in . The defect states in hydrogenated amorphous silicon (a-Si:H) and microcrystalline silicon act as trapping and/ or recombination centers, and affect the electronic devices performances based on these materials, such as solar cells. Photoconductivity measurements and PDS provide a simple way of obtaining information on the density of states in amorphous and microcrystalline semiconductors. The density of gap states can be considered as composed of tail states corresponding to Si-Si weak bond states and Si-dangling bond defect states. It is well known that the density of Si dangling bond states can be determined by chemical equilibrium process due to interconversion of weak and dangling bonds [4-6]. In this paper, we report experimental results of CPM obtained on defect states in a series of undoped and doped a-Si:H films and experimental measurement of PDS in doped and intrinsic samples. The density of states in the gap of a-Si:H samples was examined by the deconvolution analysis of the subgap spectra. The dependence of the defect concentration on Fermi level was established and analyzed by thermodynamics model [7,8] based on the chemical equilibrium reaction between the weak and the dangling bonds involving the emission and trapping of hydrogen. films were produced by reactive Radio Frequency Magnetron Sputtering deposition (RFMS). The sputtering chamber was evacuated to about 10–7 Torr. For the plasma gas mixture of 30% Argon and 70% H2, the power density of 0.9 W·cm–2 used to excite the plasma and target-sample holder distance of 70 mm was maintained constant for all the samples. For each of the two doping (n) and (p) and intrinsic samples, we used a 100˚C substrate temperature and a 30 minute deposit time. The total pressure was maintained constant at 3 Pa and the films thickness (d) was typically about for all samples. a-Si:H samples were prepared by conventional Plasma Enhanced Chemical Vapour Deposition (PECVD) using a standard reactor configuration . Doping of plasma was achieved by adding phosphine (PH3) or diborane (B2H6) gases to plasma. The samples were deposited at different substrate temperatures. 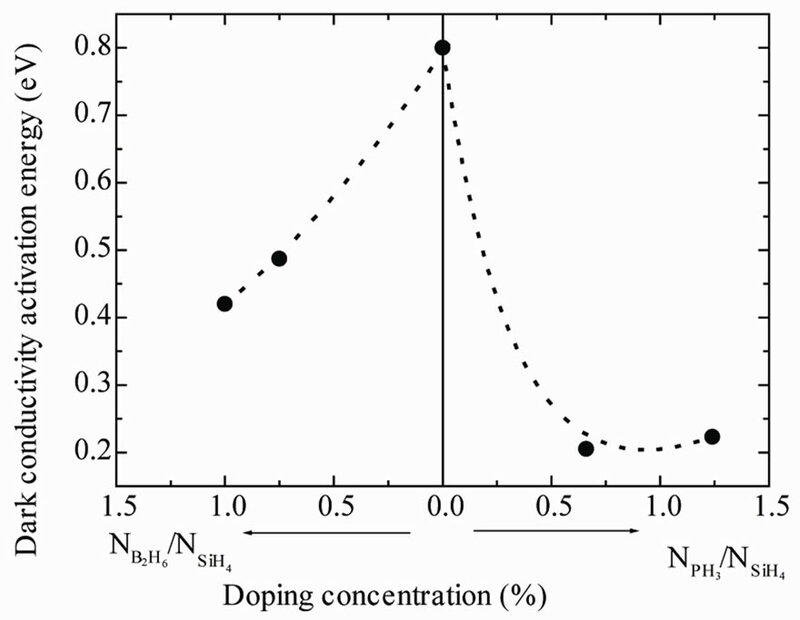 Prior to the deposition phase, the pressure and RF power were varied and the partial pressure of doping gas was taken at selected values from 0.5% to 1.5%. The parameters of deposition are summarized in Table 1. The films were deposited on glass substrate Corning (7059). Evaporated coplanar aluminium electrodes were used for the measurement of the conductivity and photoconductivity. 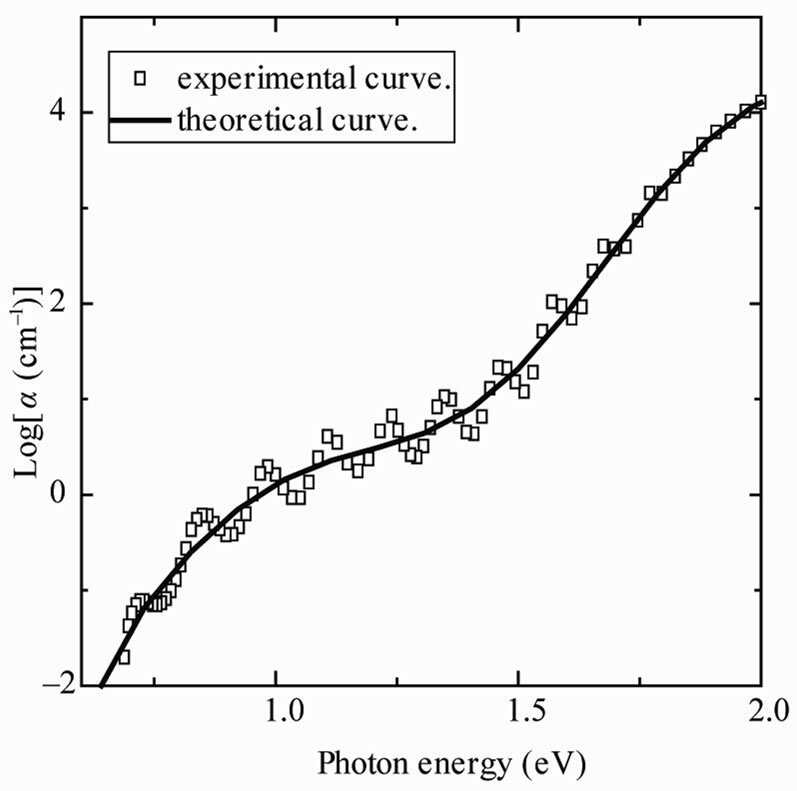 The Tauc optical gap (ETauc), the thickness (d) and the absorption coefficient α for the most absorbed wavelength were determined from the measurement of optical transmission in the wavelength ranging from 400 nm to 2400 nm. 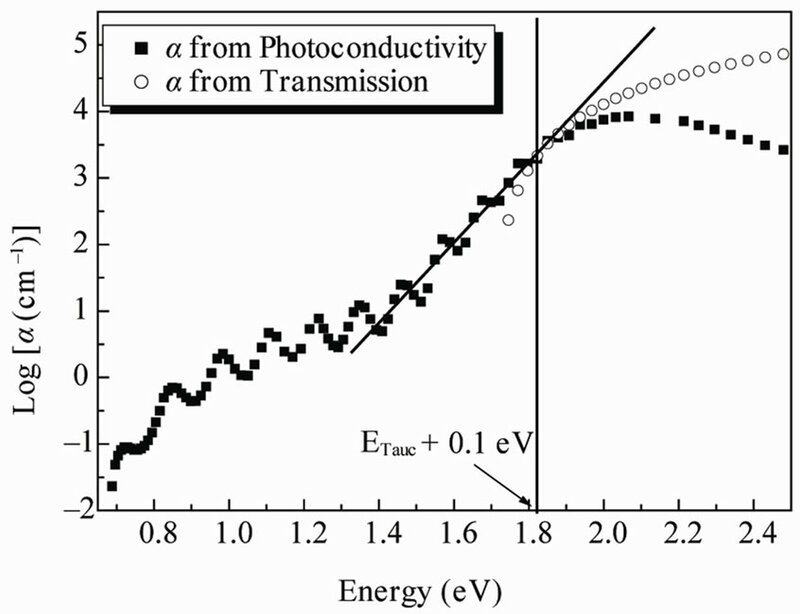 The constant photocurrent method (CPM) was used to measure the subgap absorption. where is Urbach energy, can be considered equal to the valence bandtail . The apparent Urbach energy Eov, which characterize the disorder and consequently the weak Si-Si bonds is usually determined by the linear regression in the exponential range (Figure 1). The term of proportionality (7.9 × 1015) was determined by the good correlation enter the defect density deducted in certain samples of a-Si:H and the defect density paramagnetic determined by the EPR technique, defects were identified by their factor g = 2.0055 as neutral hanging connections D˚. i-It takes into account the neutral hanging connections only, while it can have defects without spin contributing to the optical absorption. For the worst samples the defect density is very important, we can have a covering in energy enter the optical absorption involving the deep states and those bringing in states localized in the bantails, what leads then to one under estimation of the excess absorption and the defect density ND. Figure 1. The CPM spectra were normalized to the transmission measurement. The extrapolation of the Urbach tail equal to Tauc plot at . Table 1. Substrate temperature (Ts), thickness (d), RF power, partial pressure of doping (P.P). The fitting or deconvolution of the absorption spectra was also widely used and allowed to get very useful information on the DOS (Density of State) and at their distribution in the gap [14,15]. The principle of this method consists of using a model of DOS suitable to the tetracoordinated amorphous semiconductors , to calculate numerically the coefficient of absorption, while modifying systematically the parameters of adjustments of the model to obtain a better reproduction of the experimental spectra on all the range of energy. For more information on this method one can be consult the reference . For the analysis of the absorption spectra, withdrawn from CPM measurement, we used the method of deconvolution and we have developed the necessary programs for the numeral calculation to get information on the defects density of states in the gap and at their distribution in energy. The conduction and the valence band tails are described by exponential distribution. The deep-gap states are represented by a Gaussian distribution centred at ED below the conduction and mobility edge Ec. where is the pre-exponential factor, corresponding to the conductivity at infinite temperature, is the constant of Boltzmann and T represented the temperature. Figure 2. The open circle is the experimental absorption coefficient data and the solid line is the optical absorption spectra fit obtained by deconvolution procedure. Although the values of Tauc gap determined by this method are subject to pledge for the more or less thick layers, they follow the same variations as the energy E04 (correspond to ); the difference between the values of ETauc and of energy E04 remains appreciably constant. Figure 3. 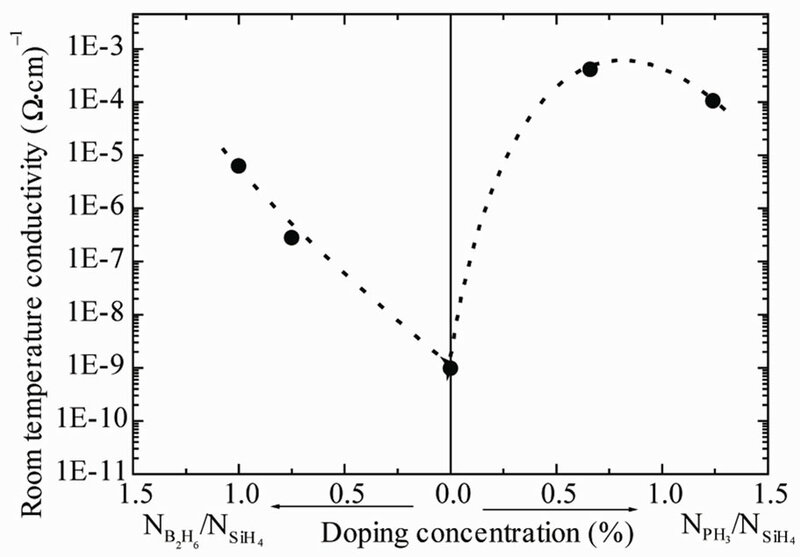 (a) The variation of the room temperature conductivity with the doping concentration of the phosphine and the diborane; (b) The dark conductivity activation energy versus the doping concentration of PH3 and B2H6. that n-type and p-type conduction was occurring. These results show that the Fermi energy (EF) still remains in localized states and EF does not reach the conducting states above the mobility edge. This is due to the high density of bandtails localized states and also to the low doping efficiency. The conductivity is lower in p-type than in n-type samples. This can be attributed also at to the wider valence bandtail which keep EF farther from the mobility edge, and may be to the doping efficiency of boron which is lower than the phosphor doping efficiency. Figure 4. The optical absorption spectra of phosphorus doped (open circle), boron doped a-Si:H (solid circle) and undoped a-Si:H (solid up triangle). position with regard to the conduction band (EC – ED). Typical characteristic parameters are summarized in Table 2. · The energy position of the neutral defect is situated at the middle of the gap EC – ED = 0.9 eV. However the energy of the positive and the negative charged dangling bonds are located at 0.6 eV and 1.2 eV from the conduction band edge respectively. This allows concluding that correlation energy can be estimated equal to 0.3 eV. deduced from relation: , were is the energy of positive or negative charged dangling, present the energy of neutral dangling and U corresponding the correlation energy. Table 2. Urbach energy E0V, deep defect density ND, defect energetic position EC – ED, gap mobility Eg, dark conductivity activation energy ∆E. Figure 5. The defect concentration as function of Fermi level obtained by the absorption spectra deconvolution (solid square). 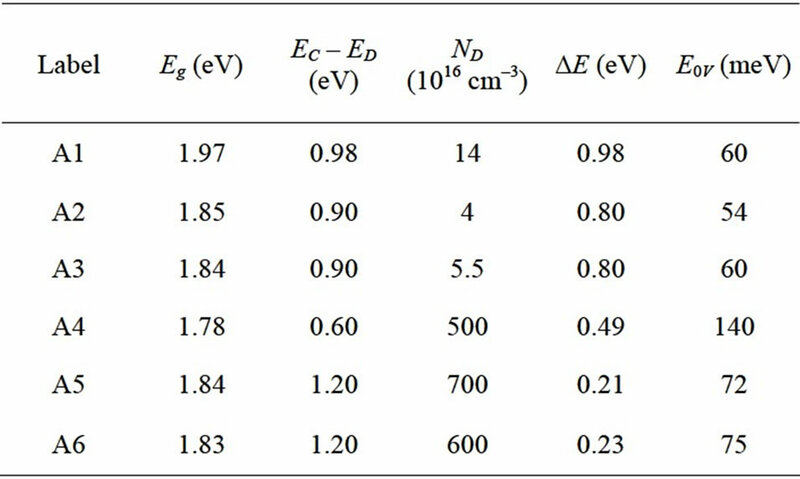 The calculated equilibrium charged defect concentrations as function of the chemical potential dotted line with E0V ≈ 60 meV, EI = 0.9 eV, NV = 6.71021 cm–3·eV–1, EF and Eg are given by the Table 2. Figure 6. 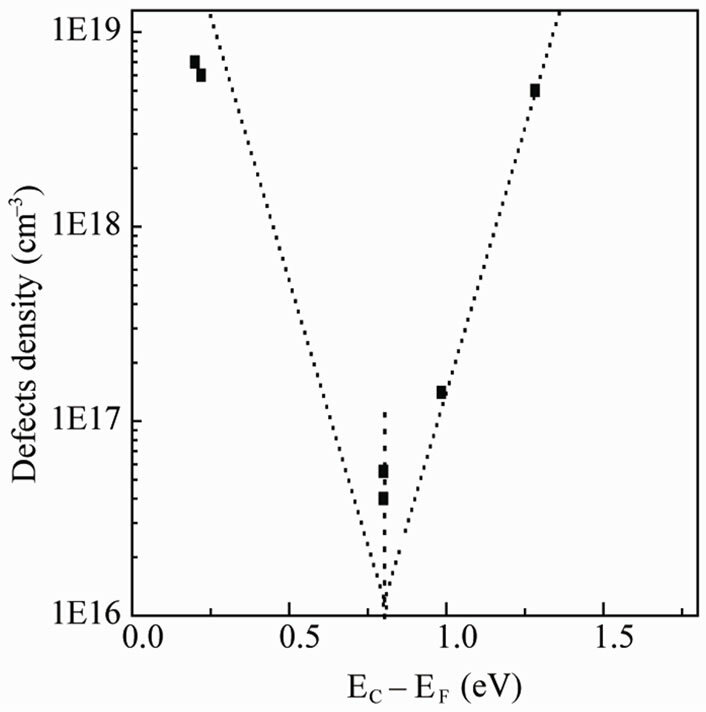 The optical absorption spectra of boron, phosphorous doped and intrinsic microcrystalline silicon . 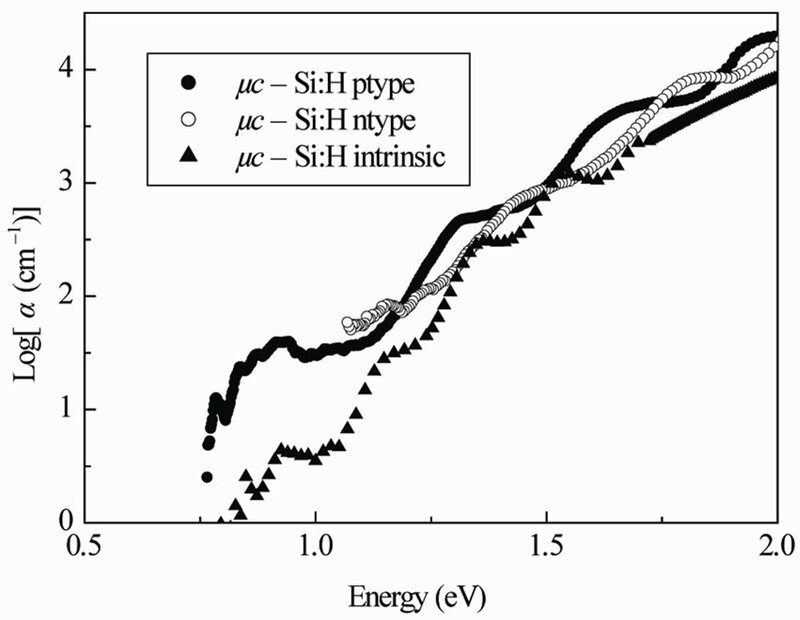 from midgap with a slope for n and p type a-Si:H. Although we have assumed that the intrinsic Fermi level EI = 0.9 eV lies at intersection point of p-type and intrinsic curves, the charged defect concentrations in a-Si:H are quite small when EF is near the midgap. This is in agreement with experience. For we represented in Figure 6 the absorption spectra obtained by Photothermal Deflection Spectroscopy (PDS) as function of photon energy for n, p doped and intrinsic samples. It in absence of quite model who allows to determine in a absolute and weak way the defects density in these materials heterogeneous, we can simply compare the absorption spectra between the doped and the intrinsic samples and say also that the increase of the level of absorption in the region of the weak energies is due to the increase of the defect density. We also notice that the doping by boron (p) or phosphorrus (n) increases the level of absorption spectra (defects density) with regard to the intrinsic sample, although we see clearly that the difference is not more important between doped spectra and intrinsic. This comportment is due to the technique of deposit (reactive Radio Frequency Magnetron Sputtering deposition (RFMS)) which deposit a samples represents a big concentration of defect. The results obtained by analysis the subgap absorption spectra deduced from CPM and PDS measurements completed by optical transmission and conductivity measurement for a-Si:H and thin films doped (n and p) and intrinsic deposited by different methods (PECVD and RFMS), shows clearly that addition of phosphine (PH3) or diboranne (B2H6) gas to silane provokes an increase in room temperature conductivity, the level of fermi shift which is signature of doping realisation. The optical absorption of phosphorus and boron doped a-Si:H are very high compared with absorption spectra of intrinsic one. The increasing of the DOS determined by deconvolution model with doping both n and p of a-Si:H are interpreted in the context of the thermodynamic model by creation of charged defect. The similar results are obtained for . However, doped by boron (p) or phosphorus (n) present also a great increase in the level absorption coefficient spectra compared to the spectra of intrinsic. The authors would like to thank Prof. K. Zellama for the electrical conductivity measurements and for many helpful discussions. K. Wener, “Defect Formation in a-Si:H,” Physical Review B, Vol. 41, No. 17, 1990, pp. 12150-12161. A. E. Wetsel, S. J. Jones, W. A Turner, D. Pang, W. Paul, I. El Zawawi, Y. Bouizem, L. Chahed, M. L. Thèye, F. C. Marques and I. Chambouleyron, “Structural Properties of Amorphous Germanium,” Materials Research Society Symposium Proceedings, Vol. 192, 1991, pp. 547-551. N. M. Amer and W. B. Jackson, “Hydrogenated Amorphous Silicon,” Semiconductors and Semimetals, Vol. 21B, 1984, pp. 83-88. K. Pierz, B. Hilgenberg, H. Mell and G. Weiser, “Correlation between Defect Density and Femi-Level Position in a-Si: H,” Journal of Non-Crystalline Solids, Vol. 97-98, 1987, pp. 91-96. S. Yamasaki, H. Okushi, A. Matsuda, H. Oheda, N. Hata and K. Tanaka, “Thickness and Doping Dependance of Optical Gap in Hydrogenated Amorphous Silicon,” Japanese Journal of Applied Physics, Vol. 20, 1981, pp. 655-660. K. Pierz, W. Fuhs and H. Mell, “Defect Creationin a-Si:H Thin Films Transistors,” Proceedings of the 19th International Conference on the Physics of Semiconductors, PIOP, Warsaw, 1989, pp. 1609-1614. N. W. Wang and S. Wagner, “Deposition of High Quality a-(Si, Ge):H Fims,” American Institute of Physics Conference Proceedings, Vol. 234, 1991, p. 186. 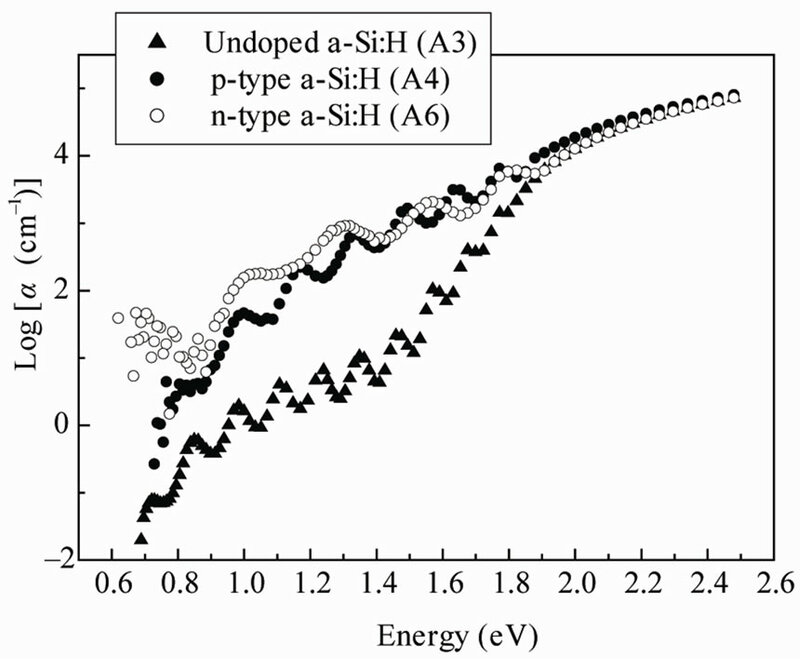 M. Vanecek, A. Abraham, O. Stika, J. Stuchlik and J. Kocka, “The Density of States in Undoped and Doped Hydrogenated Amorphous Silicon,” Physica Status Solidi (A), Vol. 90, No. 1-3, 1987, pp. 9198. A. Triska, J. Kocka and M. Vanecek, “Disordered Semiconuctors,” In: M. A. Kastner, G. A. Thomas and S. R. Ovshinsky, Eds., Plenum, New York, 1987, pp. 459- 465. R. A. Street, “Hydrogenated Amorphous Silicon,” Cambridge University Press, Cambridge, 1991.